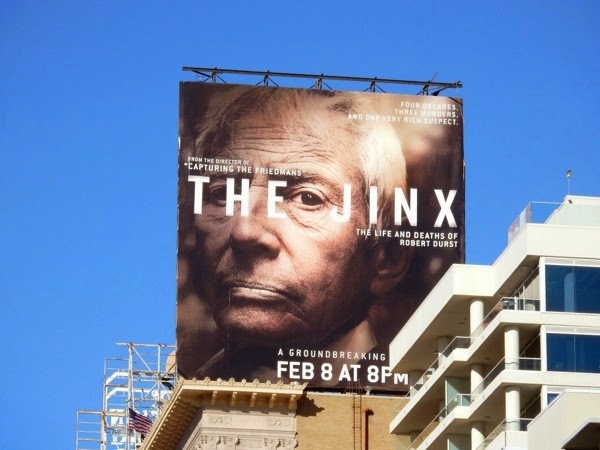 Fans of the recent popular true-crime podcast Serial will probably lap up this new six-part documentary from HBO, The Jinx: The Life and Deaths of Robert Durst. After chopping up his Texas neighbour in 2001 the notorious billionaire went on the run, but he was eventually acquitted via self-defence. But did he also kill his wife who mysteriously disappeared in New York in 1982 and a key witness in the case in 2000 in Beverly Hills? 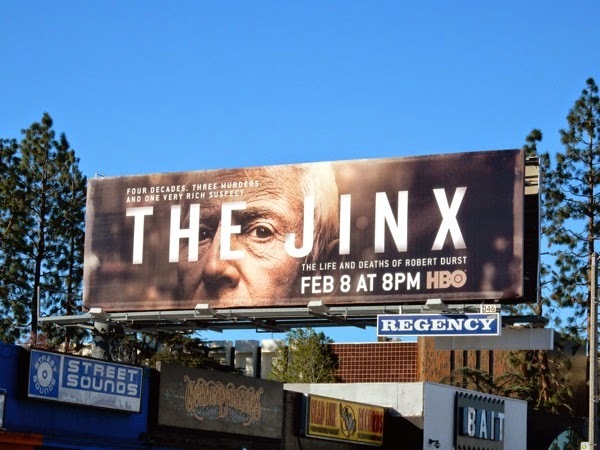 The mystery is compellingly laid out with uncovered evidence and new interviews by the Oscar nominees behind Capturing the Friedmans, Andrew Jarecki and Marc Smerling, but it's Durst's own participation which elevates the weirdness factor of this mini-series. 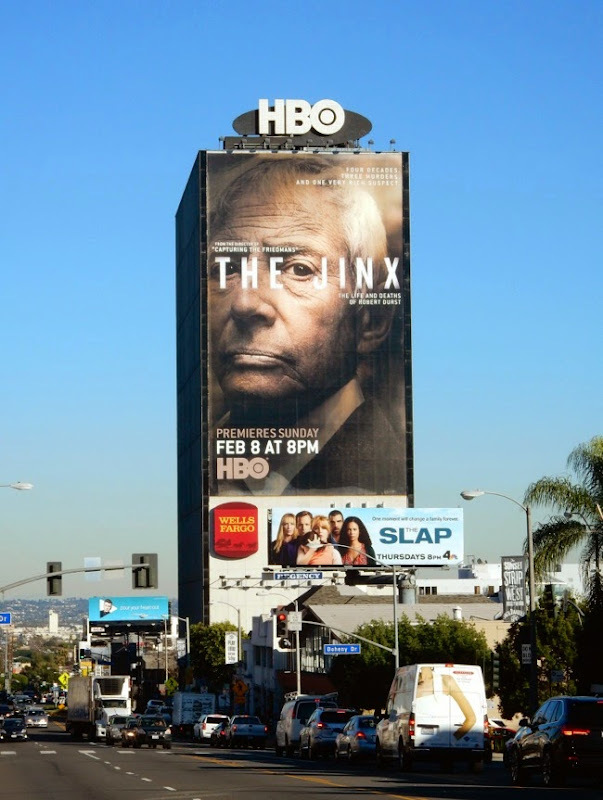 After three murders that have spanned four decades, is this bizarre character just rubbing everyone's noses in his crimes, or is he in fact, an innocent man and victim of circumstance? 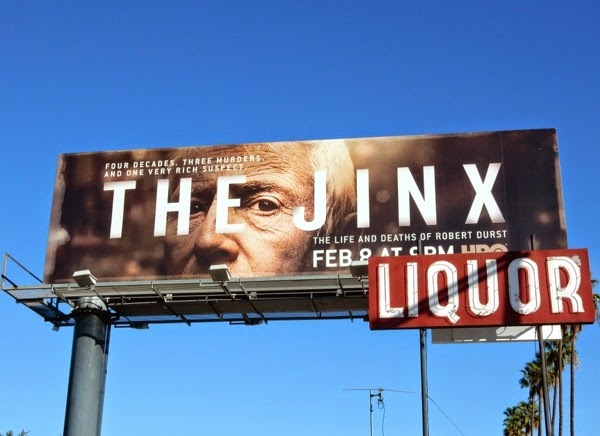 Whatever conclusions this docu-series draws, these billboards for The Jinx are certainly made to look creepy, in fact by focusing on Durst's eye they remind Daily Billboard of The River horror TV series billboards from the beginning of 2012. 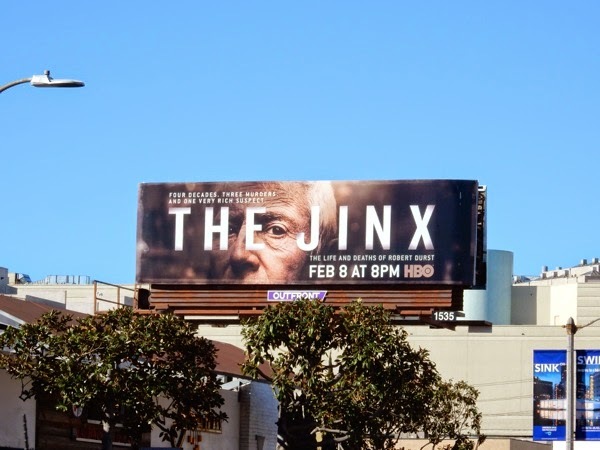 The landscape billboards for the mini-series were spotted along Melrose Avenue, Sunset Boulevard and Beverly Boulevard, whilst the square portrait billboard version was spied high over Vine Street on January 14. 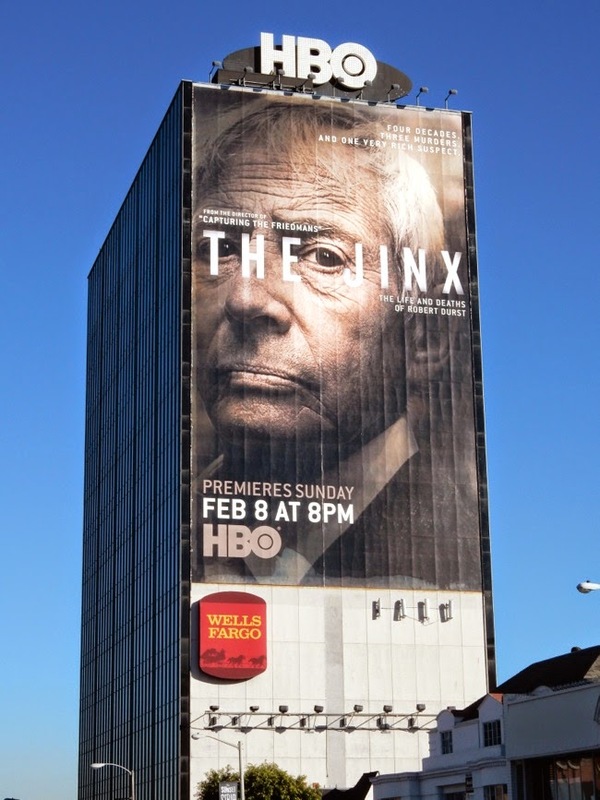 The arresting giant-sized billboard was snapped towering over Sunset Strip's eastbound route on January 23, 2015. 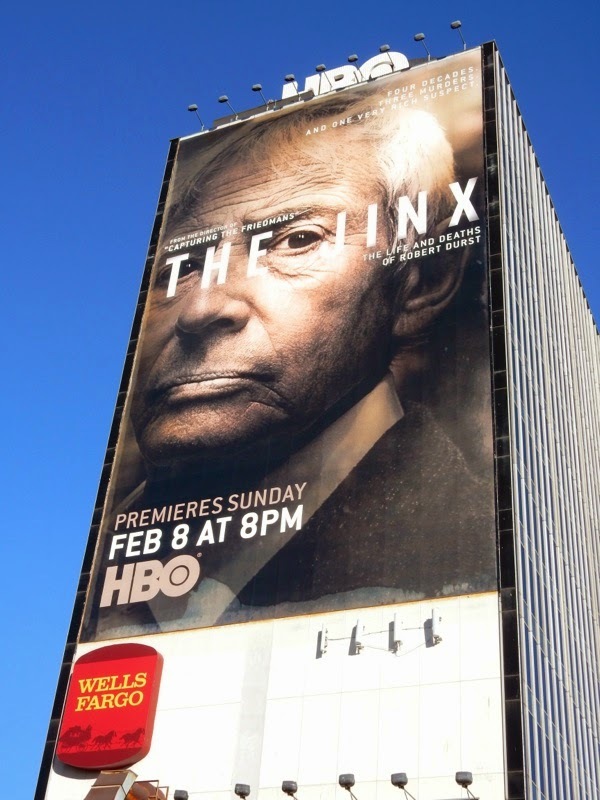 All these years later, will the real truth be told? You'll just have to watch and find out. UPDATED: Well, did anyone see that coming? 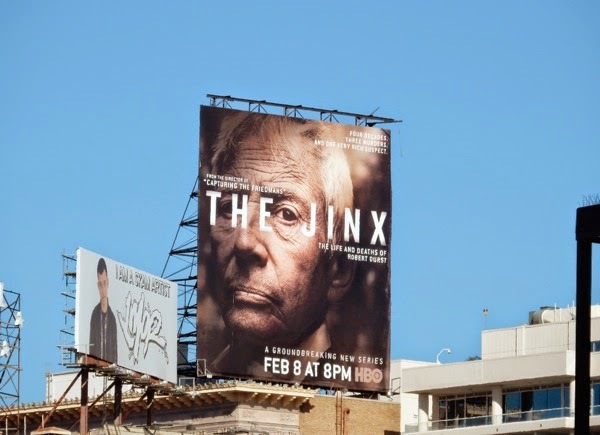 This "groundbreaking" docu-series led to the arrest of Robert Durst following his own off-camera confessions to murder. Maybe his victims will finally get the justice they deserve. 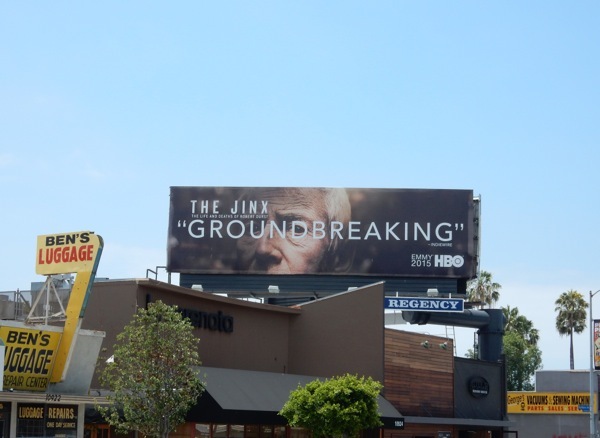 Here's the Emmy consideration billboard for the deserving show, part of HBO's 2015 Emmy outdoor ad campaign, spied along Pico Boulevard on June 5, 2015.